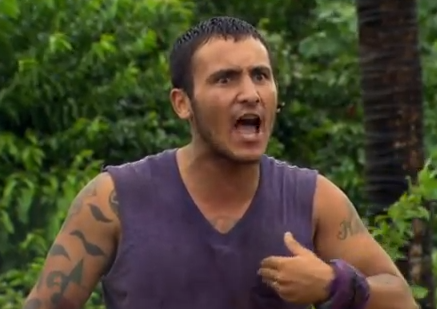 Previously on Survivor: Caramoan – Fans vs. Favorites 2 Legit 2 Quit we found out that Corinne has a truly curious and rather unsettling affection (affectation?) for gays. Well, it seems that everyone is letting all their skeletons out of the closet now, as this person who is apparently named Julia has decided she wants to pretend she has some semblance of a personality and reveal something very private and kind of gross. TMI, Ju…damn, forgot her name. Michael is taking the loss of his partner in crime (the crime being losing every Immunity Challenge) BMX Bike Sales Matt surprisingly well. In fact, he’s single and ready to mingle. And he’s in luck! Corinne is more than eager to envelop Michael and keep him close to her bosom, Mama Corinne keeping him safe in this game as long as she can. Good thing she’s been quiet about her love of gays or else someone in her alliance might start to grow suspicious. Way to play it close to the blue bikini top! In case you’ve missed every episode so far, Former Federal Agent(?) Fillip is in phenomenal shape. The guy is a freak of nature. Unbeatable in anything that emphasizes upper body strength, which, as we know, is every Survivor challenge ever. He’s so strong that he can even beat a physical specimen like John Cochran at arm wrestling. JOHN COCHRAN! A pasty yet sunburnt indoor kid who could serve as Captain America’s “before” photo; someone who is probably half Fillip’s size (which means that if Cochran played basketball at Fill’s gym then he’d be balling against guys four times his size. Wow!). So how could FFAF defeat the Hulk-like Cochran (Hulk-like in so far as he’s probably really good at physics)? Well, he’s got a can’t-lose technique. Read on: Phil goes over the top, but is he too top heavy?